At this week’s market as you peruse the produce brought to you by the good people of Deep Roots Farm, consider that their name is incredibly apt. Begun on a two and a half acre farm with a CSA in 1998, the Bolsters took root and have been growing ever since. 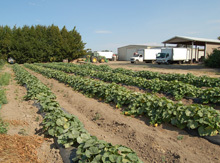 They now operate between sixteen and thirty acres growing produce and over two hundred acres of grain and seed crops, which they distribute to the community and local independent retailers, restaurants and institutions. As they’ve grown, they’ve always kept in mind what’s most important: family, the community, and having fun. Kimberly and Aaron Bolster caught the farming bug after they realized how much they enjoyed the idea of nourishing not only themselves, but their friends and surrounding neighbors. Though the farming bug skipped a generation (both Kimberley’s and Aaron’s grandparents operated farms in Eastern Oregon) it seems unlikely to do so again; there’s already talk of their children, who both love working the farmers’ markets, eventually taking over the family business. 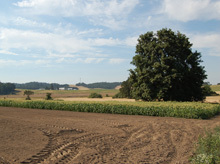 As they grow their crops, the Bolsters are ever mindful of the farm’s effect on the environment. Their goal is to become completely sustainable, which to them means avoiding off-farm inputs as much as possible. By using cover crops, green manures, beneficial organisms and on occasion locally sourced fishmeal from Astoria, they are well on their way to achieving this goal. 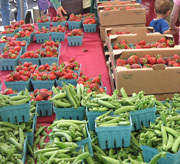 Currently at the market, Deep Roots Farm is overflowing with strawberries, greens, cucumbers and fresh herbs. Tomatoes and other produce are fast approaching and will be here soon. When I spoke with Kimberley recently she said that she was excited about all the strawberries that are now at peak harvest to market, as well as the sugar snap peas, zucchini, cucumbers, carrots, and beets. Though they have had their share of bad weather this season, things are still growing. Actually, while the outside weather has been unpredictable, it has been something of a boon in the greenhouses where milder days lead to ideal temperatures for tomatoes, eggplant, and basil. On Deep Roots Farm, there are days when it seems like things are moving a million miles an hour. Managing the fields and preparing for markets, not to mention battling bugs or struggling with crop failures, can make it a hard job at times. But a great attitude is all-important, and the Bolsters like to focus on having fun. They love to interact with their customers each week and they are always delighted to receive positive feedback from their friends in the community. Knowing that people are eating and enjoying their crops is the ultimate reward; it’s a joy, and one that they are very thankful for. At the farmers market, their joy and enthusiasm is apparent-and contagious! Be sure to stop by to see just what the Bolsters’ deep roots have produced.